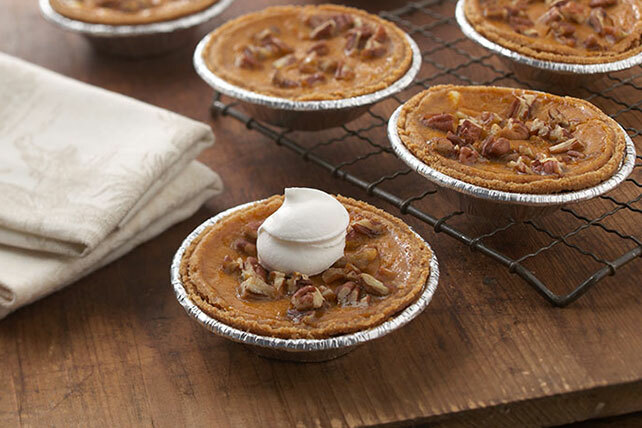 Enjoy the bold flavor of pumpkin in a smaller size with these Mini Pumpkin Pies. With these mini pumpkin pies you won't have to worry about sharing your pie with anyone else, and you'll love topping it with COOL WHIP for the perfect holiday dessert. Place pie crusts on baking sheet. Mix Neufchatel, 1 Tbsp. sugar and 1 egg until blended; spoon into pie crusts. Mix pumpkin, spice, remaining sugar and egg until blended; spoon over Neufchatel layers in pie crusts. Sprinkle with nuts. Bake 40 min. or until centers are set. Cool completely. Serve topped with COOL WHIP. Need to feed a crowd? Prepare recipe as directed, doubling all ingredients. Makes 12 servings. With their built-in portion control, these luscious pumpkin tarts make great treats.